These beach safety tips can keep your dog safe from harm when playing on a dog friendly beach. Weimaraners are strong, energetic dogs, but accidents do happen, and it is better to be safe, than sorry. 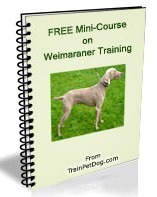 Make sure your Weimaraner is safe! 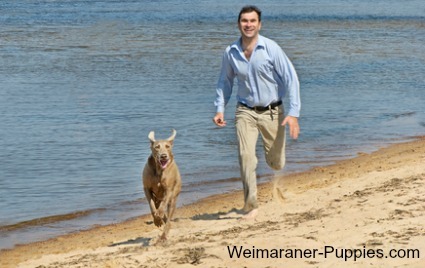 Use a little common sense and take some precautions when taking your Weimaraner dog to the many dog friendly beaches. Then, you will both have a pleasant (and safe) day at the seashore! A few beach safety tips can keep your dog safe. Dog beaches usually require that vaccinations be current. Your dog must wear a collar with Slide-On Pet ID Tag. The tag should have your cell phone # and you should carry your cell phone. Before you take your dog to the beach, make sure that he obeys the “come” command. The last thing you want to do is lose your dog at the beach! Before your dog jumps into the water, check the water for stingrays or jellyfish. Apply sunscreen to dogs with short hair or light skin. Dogs can get sunburned too! Because some sunscreens can be harmful if ingested, get one that is specially designed for dogs. Apply SPF 15 or higher to the tips of the ears, bridge of the nose, inside of their legs, and underbelly. Avoid heatstroke. Take your dog to the beach in the morning or evening when the sun isn’t so hot. Bring a beach umbrella so your dog has a shady spot to rest in. Dog beaches can get pretty hot! Never force your dog into the water. Some dogs naturally dive right in. But if your pup isn’t comfortable in the water you need to take it slowly. Make sure your dog wears his doggie life vest. After a romp at the beach, rinse your dog off. Sand and saltwater can dry out your dogs paws and can irritate the skin. Always rinse your pup off with fresh water. Keep your dog from eating any junk that has washed ashore. Curiosity doesn’t only apply to cats. Countless things wash up on the shore which could be harmful to your dog. So, think ahead before you to a dog friendly beach with your Weimaraner. Keep these beach safety tips for beaches in mind, and you both will have a good safe time! After Beach Safety Tips, where would you like to go next?